Chaikin Money Flow (CMF) is an oscillator derived from the Accumulation/Distribution Line. CMF values are calculated by adding all the A/D line values for the period and dividing this by the total volume for the period. The Chaikin Oscillator is formed by subtracting X-day exponential moving average from a Y-day exponential moving average of the accumulation/distribution line. Typical values of X and Y are (10,3). Since both Chaikin Money Flow and Oscillator rely on the Accumulation Distribution line discussed in the article published November 29, 2016, it is worth reviewing here. The Accumulation/ Distribution line is designed as a momentum oscillator, and is best used on daily, weekly and monthly stock charts, in conjunction with volume. 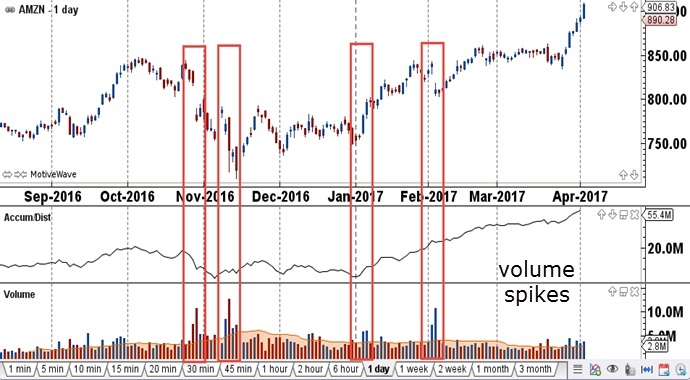 When there is strong buying pressure with high volume, this pushes the indicator higher and strong selling pressure with reduced volume pushes the indicator lower. The Accumulation/ Distribution line either reaffirms the trend or gives a warning that the trend is about to change direction. As prices continue higher with the Accumulation/ Distribution line pointing lower, this suggests selling pressure (distribution) which could forecast a trend change in the underlying market. When prices trend down, and the A/D line points up, this suggests buying pressure (accumulation) and is a bullish reversal signal for the underlying market. 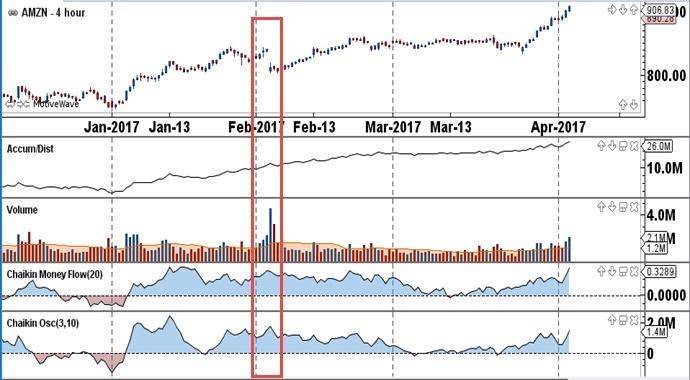 In the Amazon chart below, there were four strong signals noted within the red boxes when volume spiked. The A/D line showed selling pressure in the first box, bullish divergence in the 2nd, and buying pressure in the 3rd and 4th boxes. Chaikin Money Flow and Oscillator build on the A/D line. Instead of a cumulative total of Money Flow Volume which is what the A/D line is, CMF looks back over 20 periods and divides it by volume for the same number of periods to get an oscillator which fluctuates above and below the zero line. When the CMF fluctuates above the zero line it indicates buying pressure and below the zero line fluctuation indicates selling pressure. One can compare this value with the absolute level of money flow in the A/D line as shown in the 4-hour Amazon chart below. 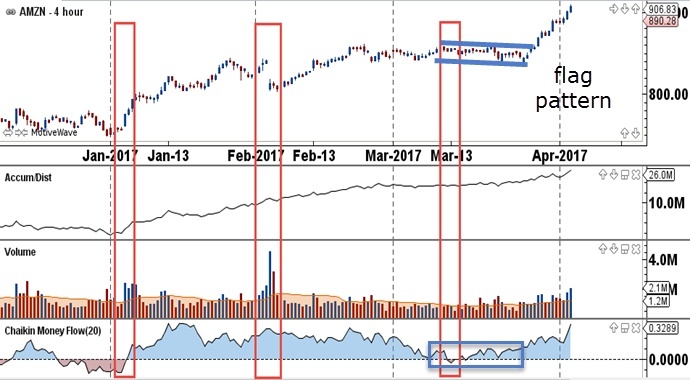 In a bullish market, the trader can look to buy the stock when the oscillator retreats to the zero line, indicating that price is running out of steam in the near term for consolidation. Looking at the A/D line confirms the uptrend but doesn’t show the nuances that the oscillator shows to make that buying decision. The Chaikin Oscillator takes the A/D Line and applies both the 3 and the 10-period exponential moving averages to the line, subtracts the 2 EMAs from one another and displays the difference around the zero line in an oscillator. Upon close observation of the chart below, there isn’t much of a difference between these two oscillators. However, the Oscillator is more of a momentum indicator, as it measures the change in momentum of the A/D line. 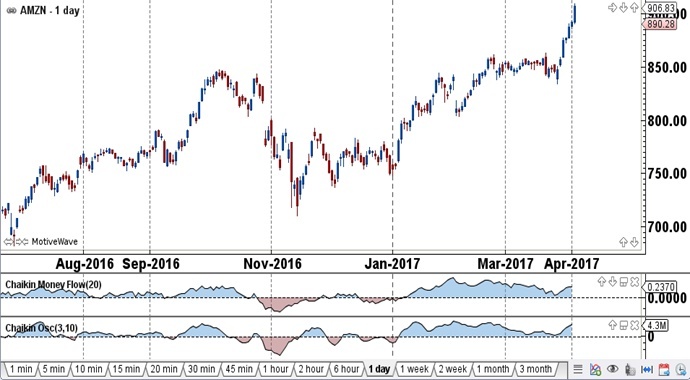 Since changes in momentum often precede a change in trend, traders can use this oscillator to anticipate changes in trend. CMF fluctuates between -1 and +1 at the extreme but for the most part stays between -.5 and +.5. When CMF is above the zero line the bias is bullish and below, it is bearish. The longer it stays above zero, the more significant the bullish trend. Whipsaw occurs when there is no follow through after a cross above or below the zero line. Some chartists filter the indicator by adding a +.05 buffer above the zero line for buys and -.05 below the zero line for exiting longs. It is advisable to use the indicator with traditional chart pattern analysis such as bull flags or sideways rectangle consolidations to confirm the bullish signals. Looking at the price action and candlestick pattern analysis is also key to trade confirmation. In the 4-hour Amazon chart above, the bullish flag pattern coincided with the CMF coming to the zero line and hovering above it during the entire flag formation, without going below the zero line. This provided an excellent buy signal. When the Chaikin Oscillator is above the zero line, the momentum of the A/D line is higher and buying pressure is higher. Below the zero line, selling pressure is higher. Look for crosses above and below the zero line, but keep the big picture in mind along with simple technical chart patterns. If bullish, take only buys when the oscillator crosses above the zero line and ignore the sells. Also, look for divergences in these oscillators which can signal a change in trend. Learn how the Chaikin Money Flow and Oscillator help confirm bullish markets and weed out bearish or sideways markets. Start incorporating the Chaikin indicators into your chart set-up. Finally, use the Chaikin indicators in developing trading strategies. This entry was posted in Trading Tips and tagged Chaikin Money Flow, Chaikin Money Flow and Oscillator, day trading, futures, indicators, market analysis, market outlook, trading strategy, trading system.